In the early morning of 21 January 1994, Moore, then 34, became involved in a confrontation with Samuel Boyd, 23, and Patrick Clark, 15, at the Wheels of Joy nightclub in San Antonio. After a shoving match, Boyd and Clark left the club, but later they returned in a car. Someone then handed Moore a .30-caliber rifle. Moore then fired six to ten shots into the car. Boyd died from a gunshot to the chest, and Clark died from a shot to the head. Moore then fled in his own car. Moore had been in and out of prison four times in the preceding seven years. Moore v. State, 969 S.W.2d 4 (Tex.Crim.App. 1998) (Direct Appeal - Reversed). Moore v. Quarterman, 534 F.3d 454 (5th Cir. 2008) (Habeas). “I would like to say that capital self-defense is not capital murder. To my wife and family, thank you for your support. I appreciate you and thank you.”Moore did not address relatives of his victims, who also watched through a window a few feet from him. Prior Convictions: 5/25/94 Attempted Murder(5 Years); 1/2/91 Possession of Cocaine (8 Years); 10/7/91 Dealing Cocaine (20 Years - Paroled in 1993). 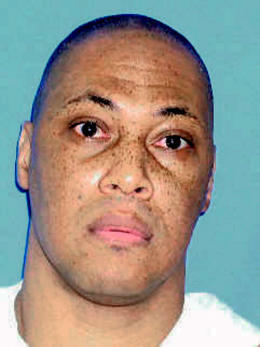 Frank Moore, 49, was executed by lethal injection on 21 January 2009 in Huntsville, Texas for the murder of two people outside a nightclub. In the early morning of 21 January 1994, Moore, then 34, became involved in a confrontation with Samuel Boyd, 23, and Patrick Clark, 15, at the Wheels of Joy nightclub in San Antonio. After a shoving match, Boyd and Clark left the club, but later they returned in a car. Someone then handed Moore a .30-caliber rifle. Moore then fired six to ten shots into the car. Boyd died from a gunshot to the chest, and Clark died from a shot to the head. Moore then fled in his own car. Moore claimed that he shot Boyd and Clark in self-defense as they were trying to run him over. Prosecutors said that Moore killed the victims because they were in a rival gang. Testimony at Moore's trial indicated that he had belonged to the Crips gang since he was 14 in California, and that he also belonged to the East Terrace Gangsters and the Black Panthers, where he was a "seargant-at-arms", responsible for obtaining, hiding, and distributing weapons. Moore admitted his involvement with the Crips as a teen, but said that he had put that behind him and was not a member of any active gangs. Less than a month before the killings, Moore was arrested for selling crack cocaine to an undercover police officer. Just prior to his arrest for the killings, Moore was arrested on an unrelated charge and was found carrying a revolver in his waistband. Also, testimony at Moore's punishment hearing indicated that prior to his arrest, he threatened to kill family members of witnesses if they cooperated with the police investigation. A jury convicted Moore of capital murder in June 1996 and sentenced him to death. The Texas Court of Criminal Appeals reversed the conviction in June 1998 because the jury was not instructed to consider convicting Moore of the lesser charges of murder or voluntary manslaughter. Moore was retried, and a jury again convicted him of capital murder in July 1999 and sentenced him to death. The Court of Criminal Appeals affirmed that conviction and sentence in January 2002. All of Moore's subsequent appeals in state and federal court were denied. In an interview from death row the week before his execution, Moore maintained his claim of self defense. "It had nothing to do with gangs or drugs," Moore said. "They were trying to kill me." Pat Moran, Moore's trial lawyer, said that Moore ran the nightclub and that Boyd and Clark planned to kill him. "They had gone around and talked how they were going to lure Frank outside and do something to him," Moran said. "It was going to be a good old-fashioned hostile takeover at the cost of Frank's life ... The problem was, Frank was a multiple-convicted felon and Frank couldn't be around firearms. There was no way to put on a defense to explain why those two kids who thought they were getting the drop on Frank walked into such an effective and efficient execution." Moore and his lawyers pressed his self-defense claim in their appeals, but to no avail. About an hour before his execution, the U.S. Supreme Court rejected a request for a reprieve based on affidavits obtained from three eyewitnesses who were said to have supported Moore's self-defense claim. "Self defense is not capital murder," Moore said in his last statement. He also expressed love to his wife and relatives, who came to witness his execution. He did not address the relatives of his victims, who also watched. The lethal injection was then started. He was pronounced dead at 6:21 p.m.
AUSTIN – Texas Attorney General Greg Abbott offers the following information on Frank Moore, who is scheduled to be executed after 6 p.m. on Wednesday, January 21, 2009. Moore was sentenced to die for the shooting deaths of Samuel Boyd and Patrick Clark in the early morning hours of Jan. 21, 1994. Frank Moore became involved in a confrontation with Samuel Boyd and Patrick Clark at a San Antonio night club, the Wheels of Joy. After a shoving match, Boyd and Clark left the club, but they returned in a car, stopping next to Moore in the club parking lot. Someone handed Moore a rifle. He fired six to ten shots into the car, killing Boyd and Clark. He then fled in his own car..
Moore has prior convictions for negligent homicide in 1982, attempted murder in 1983, and drug possession in 1990 and 1991. Shortly before the capital murder, Moore was arrested on a traffic warrant and was found to have a revolver in his waistband. He was a member of a gang known to commit robberies, aggravated assaults, murders, and drug activities. He was known to deal crack cocaine. Testimony showed that in prison he was responsible for obtaining, distributing, and hiding weapons. He acknowledged being an active participant in a prison race riot..
April 13, 1994 A Bexar County grand jury indicted Moore for capital murder. June 10, 1998 --Court of Criminal Appeals reversed the conviction and remanded for a new trial. July 8, 1999 -- After a new trial in the 226th District Court of Bexar County, jurors again found him guilty. July 13, 1999 -- After a separate punishment hearing, the trial court sentenced Moore to death. Jan. 9, 2002 -- His conviction and sentence were affirmed on appeal by the Texas Court of Criminal Appeals. Feb. 28, 2001 -- Moore filed his first state application for habeas corpus relief. May 14, 2003 -- The Texas Court of Criminal Appeals denied his application. Mar. 31, 2004 -- Moore filed his petition for habeas corpus relief in the federal court for the Western District, San Antonio. Mar. 13, 2006 -- Moore filed his second state application for habeas corpus relief. Sept. 13, 2006 -- The Texas Court of Criminal Appeals dismissed that second application as abusive. Dec. 20, 2007 -- The federal district court denied his petition for habeas corpus relief. Jan. 7, 2008 -- The federal district court denied permission to appeal. July 14, 2008 -- The Fifth U.S. Circuit Court of Appeals denied permission to appeal. Aug. 4, 2008 -- The Fifth Circuit Court denied to rehear the appeal. Oct. 17, 2008 -- The trial court scheduled the execution for January 21, 2009. Dec. 18, 2008 -- The Texas Court of Criminal Appeals dismissed as abusive his third application for habeas corpus relief. HUNTSVILLE — Condemned prisoner Frank Moore was executed Wednesday night for a double killing exactly 15 years ago in San Antonio. “Self-defense is not capital murder,” Moore said from the death chamber gurney, repeating his unsuccessful claims to the courts to stop the punishment. Moore then addressed his wife and relatives, thanking them for their support and expressing his love. He did not address relatives of his victims, who also watched through a window a few feet from him. Nine minutes after the lethal flow of drugs began, he was pronounced dead at 6:21 p.m. CDT. Moore, 47, insisted he shot Samuel Boyd, 23, and Patrick Clark, 15, in self-defense as they were trying to run him down outside a bar where they had been involved in an earlier altercation. About an hour before the scheduled punishment, the U.S. Supreme Court rejected appeals that sought a reprieve based on affidavits recently obtained by Moore’s lawyers from three eyewitnesses who supported his self-defense claims. Moore was the second prisoner executed this year in the nation’s most active death penalty state. Another Texas inmate was set to die Thursday, and three more were set for next week. Jim Wheat, one of Moore’s prosecutors, recalled that Moore “blew them away.” “Clearly, he was the guy who felt in control and they crossed the line with him,” Wheat said. Moore had an extensive criminal record when charged with capital murder. He denied being an active member of several violent gangs, as authorities contended. According to court documents, Moore belonged to the East Terrace Gangsters, who took their name from a San Antonio public housing project; was a “sergeant-at-arms” for the Black Panthers, responsible for obtaining, hiding and distributing weapons; and had been a member of the Crips gang since he was 14 in California. Moore said from prison his Crips involvement was a way of life for teens in his neighborhood, but that he long had put that behind him. Moore first went to prison in 1984 on a five-year sentence for attempted murder. He was released on mandatory supervision less than two years later, returned to prison as a violator within nine months, then was discharged in 1989. In 1991, he got an eight-year term for cocaine possession but was paroled after just four months. He returned to prison in five months with a 20-year sentence for delivery of cocaine but was paroled after serving just over two years. The double slaying occurred about 10 weeks later. The Texas Court of Criminal Appeals threw out Moore’s first conviction in 1998 because jurors weren’t allowed to consider lesser charges of voluntary manslaughter and murder. He was retried the next year and convicted and condemned again. When Moore was arrested three days after the slayings, he’d just been arrested for an unrelated crime and was found carrying a revolver in his waistband. Less than a month before the killings, he was arrested for selling crack cocaine to an undercover officer. On Thursday, Reginald Perkins, 53, was set to follow Moore to the death chamber for the slaying of his stepmother in Fort Worth eight years ago. HUNTSVILLE, Texas – Condemned prisoner Frank Moore was executed Wednesday night for a double killing exactly 15 years ago in San Antonio. "Self-defense is not capital murder," Moore said from the death-chamber gurney, repeating his unsuccessful claims to the courts to stop the punishment. He then addressed his wife and relatives, thanking them for their support and expressing his love. He did not address relatives of his victims, who also watched through a window a few feet from him. Nine minutes after the lethal flow of drugs began, he was pronounced dead at 6:21 p.m.
Moore, 47, insisted he shot Samuel Boyd, 23, and Patrick Clark, 15, in self-defense as they were trying to run him down outside a bar where they had been involved in an earlier altercation. About an hour before the scheduled punishment, the U.S. Supreme Court rejected appeals that sought a reprieve based on affidavits recently obtained by Moore's lawyers from three eyewitnesses who supported his self-defense claims. He was the second prisoner executed this year in the nation's most active death-penalty state. Another Texas inmate – Reginald Perkins convicted of the slaying of his stepmother in Fort Worth eight years ago – was set to die today, and three more were set for next week. Nine minutes after the lethal flow of drugs began, he was pronounced dead at 6:21 p.m. CST. “He’s free,” Danielle Rubens Moore, Moore’s Belgian wife by proxy, said after watching him die. Moore said from prison his Crips involvement was a way of life for teens in his neighborhood, but that he long had put that behind him. Moore first went to prison in 1984 on a five-year sentence for attempted murder. He was released on mandatory supervision less than two years later, returned to prison as a violator within nine months, then was discharged in 1989. In 1991, he got an eight-year term for cocaine possession but was paroled after just four months. He returned to prison in five months with a 20-year sentence for delivery of cocaine but was paroled after serving just over two years. The double slaying occurred about 10 weeks later. The Texas Court of Criminal Appeals threw out Moore’s first conviction in 1998 because jurors weren’t allowed to consider lesser charges of voluntary manslaughter and murder. He was retried the following year and convicted and condemned again. When Moore was arrested three days after the slayings, he’d just been arrested for an unrelated crime and was found carrying a revolver in his waistband. Less than a month before the killings, he was arrested for selling crack cocaine to an undercover officer. Frank Moore was sentenced to death for the January 21, 1994 shooting deaths of Samuel Boyd and Patrick Clark. Moore's first death sentence was set aside by an appeals court, and he was again sentenced to death by a second jury. Moore shot and killed two individuals after an altercation in the parking lot of the Wheels of Joy Club in San Antonio, Texas, around 2:00 a.m. on January 21, 1994. The persons killed were Samuel Boyd, 23-years old, and Patrick Clark, 15-years old. The first peace officer on the scene found Boyd dead or dying in the passenger seat of an automobile and Clark lying dead next to the driver's door. An investigator found shell casings in a location that suggested that the shots were fired from the left rear of the vehicle. This evidence comported with the deputy medical examiner's testimony that the tracks of the bullet wounds were generally from back to front and left to right. Boyd had been wounded by six bullets and Clark by five. Boyd's blood contained 0.28 grams per deciliter of ethanol alcohol. Clark's blood contained 0.15 grams per deciliter of ethanol, as well as 0.25 milligrams per liter of diazepam and 0.33 milligrams per liter of nordiazepam. In the opinion of the medical expert, the latter two controlled substances are muscle relaxants. Both victims were acutely intoxicated at the times of their deaths. The State called Angela Wallace, who lived in Houston and was visiting San Antonio to attend the funeral of her uncle. Prior to the night of the shootings, Wallace did not know anyone involved in the offense. She testified that she and a friend, Lisa, had gone to an icehouse across from the Wheels of Joy Club. Lisa was Boyd's girlfriend. Boyd met Lisa at the icehouse and the two verbally argued. Wallace left her friend and walked to the Wheels of Joy where she spent several hours in the nightclub; Boyd entered the club after Wallace and told her that Lisa had gone home. During the evening, Wallace saw Moore in the club and at one time Moore and Boyd shook hands and the two spoke and laughed. She also saw Clark in the club but did not see him have any contact with the Moore. Wallace testified that she did not see Boyd or Clark acting drunk or argumentative. Throughout the evening, Moore came and spoke to Wallace and flirted with her. At one point, Wallace observed two women with Moore look at her strangely and she momentarily left the club to deposit her jewelry in her car. As the club prepared to close, Moore asked Wallace to save him the last dance and to give him her telephone number. Wallace refused to give Moore her number, but he offered to give his to her. As the club was closing, Moore was interrupted by a man who stopped and whispered to him; the two men then left the club. Wallace identified this other man from photographs as Ivory Sheffield. When the club closed, Wallace left and went to the parking lot. She testified that Moore, Boyd, Clark, and another man "had a confrontation . . . an exchange of words and someone pushed somebody. . . . It just broke up. Just everybody started scattering a little bit." Wallace saw Clark's car come into the parking lot and stop. She stated that the car did not come close to striking the Moore and it did not back up. While Boyd must have at some point gotten into Clark's car, Wallace did not see him do so. Wallace testified that she saw the Moore walk towards the back of Clark's car. Sheffield got a rifle from the trunk of a Cadillac and tossed it to Moore, who started shooting into Clark's car. Moore handed the gun back to Sheffield and left in a Cadillac. Sheffield said, "Who else wants some of this?" and walked around with the gun. Wallace left the crime scene with an individual named Edmond to notify the family of Boyd and Clark. At the second trial, Moore called Robert Mays, Jr. whose testimony contradicted that of Wallace. Mays, a friend of Moore, was at the Wheels of Joy Club on the night of the shootings. Mays did not know the victims but did observe a scuffle outside the club around closing time. Someone yelled they were going to get their stuff (meaning guns) and two or three males ran across the street and got into a white car. Mays also testified they were going to shoot him. They had guns in the car and the white car came across the street into the parking lot at a high rate of speed and tried to run over Mays and others, including Moore, who tried to get out of the way. The car hit some bushes preventing it from striking Mays, and the car backed up and tried to come back at Mays. Mays made a quick getaway and heard shots as he fled the scene. A man convicted of two murders — including the murder of a 15-year-old San Antonio boy — was executed at the Texas Department of Criminal Justice Walls Unit Wednesday. Frank Moore, 49, was the second man executed in Texas this year and is part of a group of six men scheduled to be executed before Feb. 1. Moore was pronounced dead at 6:21 p.m., and his death happened to fall on the 15th anniversary of the murders. Following his second trial, Moore was sentenced to death on July 8, 1999, by the 226th District Court of Bexar County for the 1994 murders of 23-year-old Samuel Boyd and 15-year-old Patrick Clark. According to information released by the Texas Attorney General's office, Moore became involved in an altercation with Boyd and Clark at a San Antonio club called Wheels of Joy on Jan. 21, 1994. After the initial confrontation, Boyd and Clark left the establishment but returned in a vehicle and stopped next to Moore in the club's parking lot. At that point, according to the TDCJ Web site, Moore used a .30-caliber rifle to shoot and kill Boyd and Clark before fleeing the scene. Boyd received wounds to the chest while Clark was shot in the head, and both died at the scene of the shooting. Prior to the two murders, Moore had previously been convicted for negligent homicide, attempted murder and drug possession. He was also a member of a gang known to commit robberies, aggravated assaults, murders and drug activities. Before his arrest, Moore reportedly threatened to kill family members of witnesses if they cooperated with the police investigation of the murders. (CNN) -- A former drug dealer was executed in Texas on Wednesday night for the murders of two reputed gang members -- 15 years to the day after the crime. Texas death row inmate Frank Moore says he acted in self-defense when he shot and killed two in 1994. Frank Moore, 49, was pronounced dead at 7:21 p.m. ET, a spokeswoman for the Texas Department of Criminal Justice said. "Self-defense is not capital murder," Moore said before the lethal injection began, echoing his unsuccessful claims to the courts to prevent his execution. Moore did not deny firing the fatal shots outside a San Antonio bar but insisted he acted in self-defense and did not deserve to die. Moore was the second death row inmate to be executed in 2009. He spoke at length with CourtTVnews.com in 2007. Samuel Boyd and Patrick Clark were shot multiple times in the head and chest early in the morning of January 21, 1994, outside the Wheels of Joy bar. "They came with intentions to kill me," Moore said in the interview. "It was a do-or-die situation." But no witnesses ever came forward at trial to corroborate Moore's self-defense claims. Prosecutors contended that Moore, a long-time gang member with a lengthy rap sheet dating back to his teens, shot the two in cold blood to assert his authority after a shoving match broke out in the bar, according to court records. A Bexar County jury convicted Moore and sentenced him to death, but his conviction was reversed in 1998 after the Texas Court of Criminal Appeals found error in the trial court's refusal to give the jury the option of convicting Moore of a lesser offense. Even so, Moore was convicted and sentenced to death at his second trial in 1999. Moore insisted he acted in self-defense when he opened fire on Boyd, 23, and Clark, 15, at a bar near the housing projects where Moore admitted he sold crack cocaine and weapons. But it was not until 2006 that a private investigator, who once worked against Moore and his fellow gangsters, came forward with information that Moore said corroborated his self-defense claims. Warren Huel, a retired Navy Seal who was in charge of the private security firm that oversaw the projects, was the first peace officer on the scene, arriving about 45 minutes before the San Antonio Police Department, according to an affidavit. During that time, Huel said he spoke with witnesses who reported that Boyd and Clark shot at Moore first from inside the car after trying to run him over, according to the affidavit. Witnesses also told Huel that they had seen the victims' relatives remove their weapons from the car before police arrived, Huel stated in the affidavit. When Huel attempted to share the information with San Antonio Police, he says the officers told him to forget everything he had seen and learned, he said in an affidavit. "I was told that did not matter, as they already had Frank Moore, the murder weapon and an eyewitness," Huel stated in his affidavit. "I was told Moore was a dope dealer and had to go to jail." Since then, three others have come forward claiming they witnessed the shootings, providing similar details, said Moore's lawyer, David Sergi. "Unfortunately, people from the street didn't come forward to testify at the time of the trial," he said. "The problem is, the law doesn't allow for a change of circumstances." The Texas State Attorney's Office argued that Moore's claims should be dismissed because the evidence had always been available, and was not the "newly discovered" evidence the law requires. A lower court sided with the state, prompting Moore to appeal to the 5th Circuit Court of Appeals. On Monday, the court declined to hear his claims, making the U.S. Supreme Court Moore's last chance for a reprieve. The justices remained silent on the matter. Below is a letter sent to us by Frank Moore's wife, Danielle. She asks that interested people copy it, make your own modifications to express your own ideas in your own words and mail it or fax your letter to the Board of Pardons and Paroles. I am requesting by this letter that you commute Frank Moore's death sentence and recommend either clemency or a new trial. He has an execution date of January 21. Frank Moore's actions in 1994 were in self defense. Testimony against Mr. Moore by key witness Ms. Wallace was inconsistent with other testimony and concealed the whereabouts and relationship to other witness. Knowles Ray, who had key information as to the lead up to Mr. Moore's act of self defense was never called to testify. Also, evidence of the criminal history of the witnesses was not allowed in the trial by the trial judge in violation of his right to a fair trial. This evidence was essential to showing the victim was actually the aggressor. There have been several affidavits that support the claim that Mr. Moore was defending himself and new evidence has also been presented by investigator Huel that he says proves Mr. Moore was defending himself. Frank Moore was abandoned by his birth mother and through sheer willpower he survived on the streets of San Antonio on his own for many years. He had struggled and kept himself in school until the 10th grade. Since 1994 Mr. Moore has become a religious man, has grown spiritually and personally and is no longer the same person he was in 1994. Justice allows for mercy and I ask for mercy for Frank Moore. The State of Texas administers the death penalty in only 2% of murder cases and, given its finality, can never be administered fairly. The death penalty is an extreme punishment which can never be reversed, depriving the accused of the possibility of redemption. Because of these factors and because use of the death penalty has no redeeming value and no deterrent effect, I would ask that you consider it to be an extreme form of punishment in this case and recommend commutation. Defendant was convicted in the District Court, Bexar County, Peter Michael Curry, J., of capital murder and sentenced to death. Defendant appealed. The Court of Criminal Appeals, Womack, J., held that: (1) defendant was entitled to jury charge on voluntary manslaughter as lesser included offense of capital murder, overruling, Bradley v. State, 688 S.W.2d 847, and Ojeda v. State, 712 S.W.2d 742, and (2) defendant was entitled to jury charge on murder as lesser included offense of capital murder. Reversed and remanded. Background: Petitioner filed federal habeas corpus petition, challenging his Texas capital murder conviction and death sentence. The United States District Court for the Western District of Texas , W. Royal Furgeson, J., 526 F.Supp.2d 654, denied petition, and petitioner requested Certificate of Appealability (COA). Holdings: The Court of Appeals, Jerry E. Smith, Circuit Judge, held that: (1) no reasonable jurist would find that Brady was violated by government's failure to inform defendant of affidavit of owner and operator of security companies; (2) no reasonable jurist could find it debatable as to whether petitioner's Brady claim was procedurally defaulted; (3) petitioner was not entitled to COA based on reference during his second trial to fact of previous trial where curative instruction was issued; and (4) COA would not issue on whether petitioner received constitutionally effective assistance of counsel. Application denied. Frank Moore was convicted of capital murder and sentenced to death. The district court denied federal habeas corpus relief. Because no “reasonable jurist[ ] would find the district court's assessment of the constitutional claims debatable or wrong,” Miller-El v. Cockrell, 537 U.S. 322, 338, 123 S.Ct. 1029, 154 L.Ed.2d 931 (2003) (internal citations and quotations omitted), we deny Moore's request for a certificate of appealability (“COA”). A Texas jury convicted Moore of killing Samuel Boyd, 23, and Patrick Clark, 15, after an altercation in the parking lot of the Wheels of Joy Club in San Antonio around 2:00 one morning in January 1994. The state's key witness was Angela Wallace, who met Moore that night at the club and who knew Boyd and Clark. Wallace testified that Boyd and Clark arrived at the club after she did and acted in a socially appropriate manner and that there was no overt hostility between them and Moore-in fact, she reported that Boyd and Moore even shook hands and shared a laugh. Near closing time, however, Wallace watched Ivory Sheffield, apparently one of Moore's friends, whisper something to Moore, after which Moore and Sheffield left the club. FN1. The medical examiner also stated that Boyd and Clark were acutely intoxicated. FN2. Barbara Boyd, Clark's older sister and Boyd's sister-in-law, testified that she was told of the shooting and arrived at the scene, tried to wake up Boyd, then called for medical help and the police. At no time did she see anyone going through the white car or touching the bodies. Moore was convicted of capital murder and sentenced to death, but his conviction was vacated by the Texas Court of Criminal Appeals (“CCA”) on the ground that he was entitled to the inclusion of a pair of lesser included offenses in his jury charge. See Moore v. State, 969 S.W.2d 4, 6 (Tex.Crim.App.1998). FN3. The district court observed that Mays's testimony was internally inconsistent. He stated, for instance, that Moore was in the club when the white car tried to hit Mays, but he also said that Moore was outside when it happened. Mays also claimed that he left before any shots were fired but also that the men in the white car fired at least six shots at him while he fled. To explain himself, he testified that first the car tried to hit him, then he went into the club before shots were fired, then he left the club a second time, and then the people in the white car-who by that time had exited the car-started shooting at him as he ran home. The jury again convicted Moore of capital murder in 1999. During the sentencing phase, the state offered evidence that he had been convicted in the past of negligent homicide, attempted murder, and drug possession and delivery. A police officer also testified that Moore had been arrested for an unrelated matter shortly before he was arrested for the murders of Boyd and Clark and that during the first arrest, Moore was carrying a revolver in his waistband, and that the officer personally had arrested Moore for being a felon in possession of a firearm on yet another occasion. Moore was a member of the violent East Terrace Gangsters and was the “sergeant-at-arms” for the Black Panthers who was responsible for procuring, hiding, and distributing weapons. While incarcerated, Moore took an active role in a race riot, attacked a guard, and was violent in other ways and had been a member of the Crips gang since he was fourteen. At sentencing, Moore onlyFN4 offered the testimony of Frederick Buhler-who also had been at the club that night-that though he personally witnessed Moore shoot Boyd and Clark five or six times, Moore did not provoke the incident and that Boyd and Clark had a chance to leave “a long time” before being killed but did not. Though he testified that the white car “skid[ded] across the street and stop[ped] once, and then it [came] back again and it stop [ped] again,” such that “[a]t that time it was within inches of [his] leg,” Buhler did not say that Boyd and Clark began shooting at Moore before he *459 killed them or that there were any weapons in the car. FN4. Outside of the jury's presence, Moore expressly advised the court on the record that he did not want his attorney to present any additional mitigating evidence. The jury found that there was a probability that Moore would commit criminal acts of violence in the future and that there was insufficient mitigating evidence to support a sentence of life imprisonment, so he was sentenced to death. The CCA affirmed, Moore v. State, No. 73,526 (Tex.Crim.App. Jan. 9, 2002), and Moore did not petition for writ of certiorari. He filed a state habeas corpus application asserting thirty-five grounds for relief. At the hearing, he proffered no witnesses and presented no evidence; his lawyer said that the “allegations are established in the brief or in the writ ....” In February 2003, the state habeas court issued an order containing its factual findings and legal conclusions, recommending that Moore's application be denied, and the CCA adopted the recommendation. Ex parte Moore, No. 40,046-02 (Tex.Crim.App. May 14, 2003). Moore petitioned for federal habeas corpus relief in March 2004. In November 2004, the district court granted his motion for a stay and to hold his petition in abeyance so he could return to state court and exhaust a claim under Atkins v. Virginia, 536 U.S. 304, 122 S.Ct. 2242, 153 L.Ed.2d 335 (2002), but the court ordered Moore to file his state application within sixty days. In August 2005, the court directed the parties to advise it regarding this successive application, and the state reported that Moore had not yet filed it. In October 2005, Moore responded to the August order, stating that he intended to pursue a claim under Brady v. Maryland, 373 U.S. 83, 83 S.Ct. 1194, 10 L.Ed.2d 215 (1963), but he said nothing about an Atkins claim. In January 2006, the state moved to lift the stay, informing the district court that Moore, who already had participated in numerous mental health examinations, had scheduled another exam for February. The court ordered Moore to explain why the stay should not be lifted. Moore responded by saying that the stay was necessary so that he could exhaust his Brady claim, but he did not explain his lackadaisical prosecution of his Atkins claim. In August 2006, the court lifted the stay and ordered Moore to file his amended petition within thirty days, but Moore did not. In September, the court ordered Moore to show cause for the delay; Moore replied by filing his amended petition, asserting twenty-two claims, none addressing Atkins. The state responded to the amended petition in January 2007, and Moore replied in May. In March 2006, Moore again applied for state habeas relief, asserting that state prosecutors and police had violated his rights under Brady. The CCA rejected that successive application as an abuse of the writ. Ex parte Moore, No. 40,046-03, 2006 WL 2615542 (Tex.Crim.App. Sept.13, 2006). In December 2007, the district court denied relief on all claims, and in January 2008 it declined to grant a COA. Moore claims that state officials withheld evidence favorable to his cause, both as to guilt and punishment,FN7 contrary to Brady. “To establish a Brady violation, a defendant must make three showings: ‘The evidence at issue must be favorable to the accused, either because it is exculpatory, or because it is impeaching; that evidence must have been suppressed by the State, either willfully or inadvertently; and prejudice must have ensued.’ ” United States v. Sipe, 388 F.3d 471, 477 (5th Cir.2004) (quoting *461 Strickler v. Greene, 527 U.S. 263, 281-82, 119 S.Ct. 1936, 144 L.Ed.2d 286 (1999)). For evidence to be materially prejudicial, “[t]he question is not whether the defendant would more likely than not have received a different verdict with the evidence, but whether in its absence he received a fair trial, understood as a trial resulting in a verdict worthy of confidence.” Kyles v. Whitley, 514 U.S. 419, 434, 115 S.Ct. 1555, 131 L.Ed.2d 490 (1995). We ask, therefore, whether “the favorable evidence could reasonably be taken to put the whole case in such a different light as to undermine confidence in the verdict.” Id. at 435, 115 S.Ct. 1555. “In short, [a defendant] must show a ‘reasonable probability of a different result.’ ” Banks v. Dretke, 540 U.S. 668, 699, 124 S.Ct. 1256, 157 L.Ed.2d 1166 (2004) (quoting Kyles, 514 U.S. at 434, 115 S.Ct. 1555). FN7. The government argues that Moore did not raise a punishment-related Brady claim in the district court. We need not decide whether that argument is waived, however, because it is meritless for the reasons stated below. FN8. Whether Huel spoke with the police is a factual question that does not appear to be answered in the record. All that we have is his affidavit. For purposes of this COA application, we assume that Huel told the police what he claims in the affidavit to have told them. FN9. Moore argues that not only did police officers fail to disclose Huel's statement to Moore, they also intimidated Huel such that he did not come to Moore sooner with the information. Moore, however, offers no evidence, or even intimation of evidence, of intimidation. The closest thing to threats in the affidavit are the statements that Huel's information “did not matter” and “Moore was a dope dealer and had to go to jail.” If those are threats, they are heavily veiled. The CCA denied Moore's successive state habeas application as an abuse of the writ. Ex parte Moore, No. 40,046-03, 2006 WL 2615542 (Tex.Crim.App. Sept.13, 2006). The district court also denied federal habeas relief, listing three reasons: first, that this claim was procedurally defaulted; second, that it was barred by the statute of limitations; and third, that it lacked merit in any case. The district court's assessment was undebatably correct, though we do not reach the limitations issue. FN18. Though “[i]n assessing the adequacy of petitioner's showing ... the district court is not bound by the rules of admissibility that would govern at trial,” the court is permitted to consider the “unreliability” of the proffered evidence. Schlup, 513 U.S. at 327-28, 115 S.Ct. 851 (internal citations and quotations omitted). In assessing Huel's affidavit, reasonable jurists would not debate that the persuasiveness of the affidavit should be discounted, because it consists primarily of vague third-party statements. FN19. Moore also argues that it contravenes the Eighth Amendment to sentence him to death, because he is actually innocent of the crime. Though acknowledging that this argument is “inextricably linked” to his Brady claim, he offers it as a separate reason a COA should issue. This is wrong, and undebatably so. “ Herrera [ v. Collins, 506 U.S. 390, 113 S.Ct. 853, 122 L.Ed.2d 203 (1993)] does not overrule previous holdings (nor draw them into doubt) that a claim of actual innocence based on newly discovered evidence fails to state a claim in federal habeas corpus.” Lucas v. Johnson, 132 F.3d 1069, 1074 (5th Cir.1998). In any event, undebatably, Moore in no way can show that he is actually innocent. Moore requests a COA based on several comments uttered during his second trial that referred to his first trial. From them, he claims that the state trial court's decision to deny his motions for a mistrial violated his right to a presumption of innocence. No reasonable jurist could find it debatable that Moore's constitutional rights were not violated. During the guilt phase of the second trial, police officer Steven Patterson testified as follows on cross-examination: Q. Now, you have no idea what Officer Glen testified to in front of this jury about what the scene looked like when he arrived, do you? Because you were outside and you were under the Rule; is that right? A. Yes, sir. Q. So then whatever he told the jury about what the scene was like when arrived, you have no idea what he told them, correct? A. Other than what I've heard over the past five years. Q. But as far as today? A. No, sir. Q. And you are aware, are you not, that Officer Glenn has never testified in any court proceeding or anything involving this case? A. I wouldn't-I wasn't sure if he testified in the last trial, or not. Q. Now, do you know an Officer Reyes, probationary Officer Reyes, who was there that night? A. I just-I couldn't pick him out today. I haven't seen him probably since then, a person [ sic] since that last trial. Mr. Moran: And, Your Honor, may we approach the bench? Ladies and gentlemen of the jury, I ask you not to consider, for any purpose whatsoever, any reference or remark that you have heard concerning a prior hearing in this case. It has absolutely nothing to do with this case. You are to concern yourself with the evidence in this case and only in this case and arrive at at [ sic] fair and impartial verdict based strictly on the evidence that you hear here. Q. And then I think you had mentioned something about the gangs and prostitution and all this kind of stuff and everything. And actually, the records are contained in those exhibits, that have already been introduced, show that on several different occasions, Mr. Moore has been evaluated, as far as sexual orientation, and has always been found to be appropriate by the sociologist who interviewed him, hasn't he? A. As far as I know, yes, sir. Q. Now, this-well, this exhibit here, number-if I have it. Did you help in putting this exhibit together? A. Yes, sir, I did, at the last trial. Mr. Moran: May we approach the bench? These three references to the prior trial are the only ones cited by Moore. He argues that the denials of his mistrial motions violated his right to the presumption of innocence under the Fifth Amendment. The CCA heard and rejected that argument on direct appeal, holding that the statements were “passing and vague references,” that they did not inform the jury of the outcome of the earlier trial, that Hicks's statement occurred after Moore had already been convicted and thus that the presumption of innocence did not apply, and that whatever prejudice resulted was cured by the prompt curative instructions. See Moore v. State, No. 73,526, at 8-9 (Tex.Crim.App. Jan. 9, 2002). In support of this claim, Moore cites United States v. Aragon, 962 F.2d 439 (5th Cir.1992), and United States v. Faulkner, 17 F.3d 745 (5th Cir.1994), both dealing with mid-trial publicity. Neither was a habeas case, and neither even purported to apply “clearly established federal law as determined by the Supreme Court ....” 28 U.S.C. § 2254(d). In neither was the prejudicial extra-judicial material anywhere near as innocuous as the statements at issue here. FN20. Not only could no reasonable jurist find it debatable that “clearly established” law might support Moore's claim, no reasonable jurist could conclude that the Constitution was even violated. Here, the only information that was conveyed to the jury was that Moore had been tried before. The jury did not learn that he was convicted before; in fact, it did not learn any specific information at all. For instance, a juror would not have known whether the reference to “last trial” even was an allusion to a trial for Moore, as opposed to one for Sheffield. Likewise, even if the jury believed it was an allusion to a previous trial for Moore, the jury did not know that Moore had been convicted, thereby prejudicing Moore's defense; it just as easily could have believed that an earlier jury was deadlocked as to Moore's guilt. Any prejudice to Moore thus was slight. Balanced against that slight prejudice were the trial court's explicit and comprehensive curative instructions. Given that juries are presumed to follow instructions, Zafiro v. United States, 506 U.S. 534, 540-41, 113 S.Ct. 933, 122 L.Ed.2d 317 (1993), no reasonable jurist could debate that Moore's constitutional rights were not violated. Because the law is so pellucid on these points, we need not delve into whether Moore's attorney invited Patterson's reference to the prior trial by asking whether he knew whether “Officer Glenn ha[d] never testified in any court proceeding or anything involving this case?” We also need not decide whether Hicks's statement, made after Moore was convicted but before he was sentenced, unconstitutionally deprived Moore of the presumption of innocence. FN21. When Moore raised this claim in his state habeas application, an evidentiary hearing was held, and, as a result of that hearing, the CCA denied the claim for the reasons stated by the state habeas trial court. See Ex parte Moore, No. 40,046-02 (Tex.Crim.App. May 14, 2003). To demonstrate that his lawyer's conduct fell below what is constitutionally acceptable, Moore “must show that [his] counsel's performance was deficient, and that the deficiency prejudiced the defense,” and “[t]o establish deficient performance,” he “must demonstrate that [the] representation fell below an objective standard of reasonableness[, with] the proper measure of attorney performance [being] simply reasonableness under prevailing professional norms.” Wiggins v. Smith, 539 U.S. 510, 521, 123 S.Ct. 2527, 156 L.Ed.2d 471 (2003) (internal citations and quotations omitted). “[T]o establish *468 prejudice, a ‘defendant must show that there is a reasonable probability that, but for counsel's unprofessional errors, the result of the proceeding would have been different. A reasonable probability is a probability sufficient to undermine confidence in the outcome.’ ” Id. at 534, 123 S.Ct. 2527 (quoting Strickland v. Washington, 466 U.S. 668, 694, 104 S.Ct. 2052, 80 L.Ed.2d 674 (1984)). We must be mindful that “[t]he measure of performance is highly deferential, calibrated to escape ‘the distorting effect of hindsight.’ We must ‘indulge a strong presumption that counsel's conduct falls within the wide range of reasonable professional assistance’ and that the ‘challenged action might be considered sound trial strategy.’ ” Belyeu v. Scott, 67 F.3d 535, 538 (5th Cir.1995) (quoting Washington, 466 U.S. at 689, 104 S.Ct. 2052). To prevail, therefore, Moore must “allege[ or] tender[ ] evidence of concrete facts sufficient to overcome [the] presumption[ ].” West v. Johnson, 92 F.3d 1385, 1409 (5th Cir.1996). Moore cannot meet this burden, and undebatably so. When he made his Washington claim in his state habeas application, the court held an evidentiary hearing. Moore failed to provide any evidence at all regarding the thought process underlying his trial counsel's decisionmaking. He made no effort to inquire of his attorney as to what steps were taken to investigate the shooting, so we do not know whether the counsel made a strategic decision not to speak with these witnesses or what might have been the basis of that decision. Crucially, we also do not know what Moore told his lawyer; if the lawyer learned from Moore directly that the killings were not in self-defense, it would not be surprising that the lawyer did not dredge unceasingly for witnesses who would say otherwise. If there was potentially exculpatory or mitigatory evidence-which we do not know that there was, because Moore has never produced it-we do not know why his counsel did not present it at trial. Moore did not avail himself of the opportunity to present evidence of ineffective assistance in the Texas courts. FN22. The state habeas trial court found that Moore presented no evidence that Wilford, Hopkins, or Davis was available to testify or personally possessed relevant knowledge. Thus, the court found that Moore did not satisfy his burden under Washington, and the CCA adopted those findings and conclusions. Ex parte Moore, No. 40,046-02 (Tex.Crim.App. May 14, 2003). FN23. See, e.g., Anderson v. Collins, 18 F.3d 1208, 1221 (5th Cir.1994) (“Anderson again makes only brief and conclusory allegations that [his lawyer's] representation was deficient because of his failure to investigate and develop useful evidence. Typically, he does not specify what this investigation would have divulged or why it would have been likely to make any difference in his trial or sentencing .... [W]ithout a specific, affirmative showing of what the missing evidence or testimony would have been, ‘a habeas court cannot even begin to apply [ Washington’ s] standards' because ‘it is very difficult to assess whether counsel's performance was deficient, and nearly impossible to determine whether the petitioner was prejudiced by any deficiencies in counsel's performance.’ ”) (quoting United States ex rel. Partee v. Lane, 926 F.2d 694, 701 (7th Cir.1991)). See also Neal v. Puckett, 286 F.3d 230, 237 (5th Cir.2002) (en banc) (“In assessing counsel's performance, we look to such factors as what counsel did to prepare for sentencing, what mitigating evidence he had accumulated, what additional ‘leads' he had, and what results he might reasonably have expected from these leads.”). FN24. See, e.g., Bell v. Cone, 535 U.S. 685, 699, 122 S.Ct. 1843, 152 L.Ed.2d 914 (2002) (holding that the burden is on the petitioner to do more than just “convince a federal habeas court that, in its independent judgment, the state-court decision applied [ Washington] incorrectly,” but instead the petitioner “must show that the [state court] applied [ Washington] to the facts of his case in an objectively unreasonable manner”). The application for a COA is DENIED.